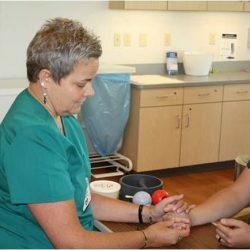 Jennifer Neiheiser, a certified hand therapists, demonstrates a therapy technique. Reading, Pa. — An injury to the hand can be devastating, resulting in an inability to perform basic tasks, to work or to enjoy favorite activities. Hand therapists at Penn State Health St. Joseph have seen the results of injuries to the hand again and again, and are dedicated to helping patients improve their conditions and get back to their lives. Hand therapists also treat wrist and elbow problems, and some address shoulder injuries, as well. Although physicians and therapists have recognized the need for specialized therapy for patients with hand injuries since World War II, the first certification program was not established until 1991. Injuries to hands and fingers are among the most common workplace injuries, and can be complicated because of the way the hand is constructed. There are 28 bones in each hand. Someone working toward certification as a hand therapist is an occupational therapist with a minimum of three years of clinical experience, completion of 4,000 hours of direct practice in hand therapy, and passing of an exam. Once certified, hand therapists must complete ongoing continuing education in order to maintain their status. Aaron Dearstyne is an occupational therapist at Penn State Health St. Joseph who is working toward becoming a certified hand therapist. It is a demanding undertaking, he said, but the work is important. A hand injury can be caused by a traumatic event, such as a hand getting caught in machinery or a fall. Hand pain also can be caused by a condition such as arthritis or carpal tunnel syndrome. St. Joseph is seeing more patients with serious damage to their hands, such as that caused by a crush injury, because patients are being referred to the hospital from Hershey Medical Center. Four or five hand surgeons at Hershey refer patients to St. Joseph therapists, who treat over 100 patients a month on an outpatient basis. The first step in hand therapy, said Dearstyne, is to work at healing any wounds. One of their goals, explained Neiheiser, is to teach patients exercises they can do at home in order to assure that their progress continues. While patients are still being treated at the hospital, they work with therapists in a specialized setting that enables them to practice tasks of daily living and regain as much use of their hands as possible. While the goal is complete recovery, sometimes that is not possible, Neiheiser said. In those cases, therapists become psychologists and cheerleaders, urging patients to focus on what they can do, instead of what they cannot.